0 -- Goals scored by Gretzky in seven regular-season games at the United Center in Chicago, the most regular-season games he played in any building without scoring a goal. (He did have two playoff goals there.) Gretzky went without a goal in only seven of the 49 arenas in which he played. the only one in which he didn't get a point was the Springfield Civic Center, where he played one game in 1979-80 for Edmonton against the Hartford Whalers, who were playing there while the Civic Center in Hartford was undergoing repairs. 1 -- Goals scored by Gretzky in 449 of his 1,487 NHL games. He also scored two goals 129 times and had 37 three-goal games, nine four-goal performances and four five-game games. 2 -- Points by Gretzky in six games at the Corel Centre (now Scotiabank Place) in Ottawa, the fewest he had at any arena in which he played more than two games. Gretzky had only a pair of assists in his six visits to Ottawa. 2.2 -- Gretzky's points-per-game average in the 635 regular-season games he played in Canada. He had 480 goals and 939 assists for 1,419 points in those games. In the 852 regular-season games he played in the United States, Gretzky averaged 1.7 points. Overall, he averaged 1.92 points in 1,487 games. 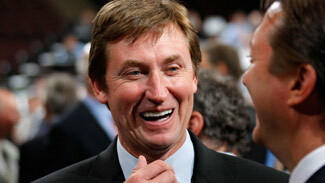 3 -- NHL games needed by Gretzky to score his first NHL goal. After going without a goal in his first two games, he got goal No. 1 against Glen Hanlon of the Vancouver Canucks in a 4-4 tie at home on Oct. 14, 1979. 4 -- 200-point seasons by Gretzky, the only ones in NHL history (Mario Lemieux was closest with 199 in 1988-89). He had three of them in a row beginning in 1983-84 and capped off by his NHL-record 215 points in 1985-86, when Gretzky had at least one point in 77 of Edmonton's 80 games. 5 -- Penalty shots taken by Gretzky in the regular season. Amazingly, he scored on only one of them -- for Edmonton against Vancouver's Richard Brodeur on Jan. 19, 1983. Gretzky also scored on his only penalty shot in the Stanley Cup Playoffs, beating Minnesota's Don Beaupre on April 28, 1984. 6 -- Assists by Gretzky in Edmonton's 13-3 victory against Los Angeles on April 9, 1987, matching Mikko Leinonen's NHL record for most assists in a Stanley Cup Playoff game. 7 -- Assists by Gretzky in a regular-season game (on three occasions), matching the mark set by Detroit's Billy Taylor against Chicago in 1947. Gretzky set up seven goals in Edmonton's 8-2 home win over Washington on Feb. 15, 1980, at Chicago in a 12-9 victory on Dec. 11, 1985, and in an 8-2 home win over Quebec on Feb. 14, 1986. 8 -- Consecutive seasons in which Gretzky won the Hart Trophy as the League's MVP, a mark that figures to be tough to beat. He won from 1980-87 as an Edmonton Oiler, then captured his ninth and final Hart Trophy as a member of the Los Angeles Kings in 1989. 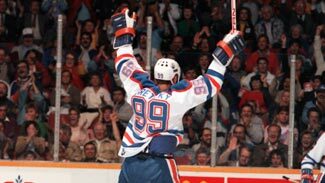 9 -- Goals scored by Gretzky in 1998-99, his last NHL season and by far the fewest of his career. He did have 53 assists (ninth in the League) for 62 points, also his lowest total in a full season. 10 -- three-or-more-goal games by Gretzky in both 1981-82 and 1983-84, an NHL record (Mike Bossy is next with nine). 12 -- Playoff goals scored by Gretzky against Mike Vernon, the most he had against any goaltender. 15 -- 100-point seasons for Gretzky, an NHL record. He also holds the mark for consecutive 100-point seasons with 13. Gretzky broke the century mark in each of his first 13 seasons until he was limited to 45 games due to injuries in 1992-93. 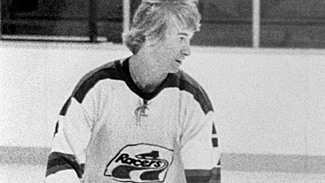 17 -- Age at which Gretzky turned professional, with the Indianapolis Racers of the World Hockey Association. He was later traded to the Edmonton Oilers, who retained his rights when they entered the NHL in 1979. 29 -- Goals scored by Gretzky against Richard Brodeur, his highest total against any goaltender. Mike Liut (23), Don Beaupre (21), Kirk McLean (21) and Greg Millen (21) were the other goaltenders to allow more than 20 goals to Gretzky. In all, 155 NHL goaltenders allowed at least one goal to the Great One. 38 -- Goals scored by Gretzky at the Winnipeg Arena, the most he scored at any building in which he played solely as a visiting player. the Pacific Coliseum in Vancouver and Maple Leaf Gardens were next with 30. His 108 points in Winnipeg were also the most he had at any arena he didn't call home. 39 -- Games needed by Gretzky to reach the 50-goal mark in 1981-82, still the fewest by any player. the last five goals all came in Game No. 39 during Edmonton's 7-5 victory over the Philadelphia Flyers. 42 -- Arenas in which Gretzky scored at least one regular-season NHL goal. He had 10 or more goals in 18 buildings and exactly one in eight others -- including three (the thunderdome, the Ice Palace and Expo Hall) that were home to the Tampa Bay Lightning. 50 -- Games in which Gretzky scored three or more goals, an NHL record and 10 more than Lemieux, who's second. Gretzky had 37 three-goal games, nine four-goal games and four games in which he scored five times. 51 -- Consecutive games in 1983-84 in which Gretzky had at least one point, an NHL record. It was one of three times in which Gretzky had a point-scoring streak of 30 games or more. 73 -- Shorthanded goals scored by Gretzky -- not surprisingly, he leads in this category as well. 98 -- Gretzky's best single-season plus-minus rating, in 1984-85, when he led the NHL. It was the fourth of six consecutive seasons in which he was plus-60 or better. He finished his career at plus-503. 157 -- Goals scored by Gretzky in December, the most he had in any month. He had 154 in November, 152 in January, 144 in March, 136 in February and 126 in October. Gretzky also 25 goals in 72 regular-season games in April and was held without a goal in two regular-season games played in May 1995. 196 -- Goals by Gretzky on which Jari Kurri earned an assist. Kurri has the most assists on Gretzky's goals by any player. Paul Coffey is next with 116, followed by Mark Messier with 68 and Glenn Anderson with 63. Among players who didn't play with Gretzky in Edmonton, Luc Robitaille is the leader with 48. 266 -- Regular-season games (of 1,487 in his career) in which Gretzky failed to record at least one point. He was held without a goal in 848 games and without an assist 443 times. 364 -- Assists by Gretzky on goals by Kurri, by far the most he had on goals scored by any one player. Gretzky assisted on 115 goals by Robitaille and 106 by Anderson. In all, Gretzky assisted on goals by 141 players. 369 -- Shots on goal by Gretzky in 1981-82, when he set the NHL record with 92 goals and the most he ever took in one season. Gretzky's shooting percentage that season was 24.93 percent; for comparison, Alex Ovechkin (the only player to reach 60 or more goals in more than a decade) needed 446 shots to get 65 goals in 2007-08 -- his shooting percentage was 14.6. 424 -- Career game in which Gretzky scored his 1,000th NHL point. the milestone came when he assisted on a goal in Edmonton's 7-3 win over Los Angeles on Dec. 19, 1984 -- just over a month before his 24th birthday. the next-closest is Lemieux, who got his 1,000th point in his 513th NHL game. 493 -- Goals scored by Gretzky in his 745 regular-season home games, including a League-record 59 in 1981-82. He also had 401 goals in 742 road games, with a high of 43 in 1983-84. 970 -- Margin between Gretzky's regular-season point total and that of Messier, who's No. 2 on the all-time scoring list. Gretzky had 2,857 points; longtime teammate Messier is next with 1,887. Gretzky has more assists (1,963) than any NHL player has points.